Tagged Vintage Christmas. Bookmark the permalink. What a lovely post! My mom had a tinsel tree in the basement with pink balls! So unlike her! Of course the live tree in the living room, but that was it! No stockings were ever hung, she didn’t want tack holes in the mantel, lol! Four huge trees sound amazing, those people must have been very wealthy. Thanks so much for stopping by my blog, I enjoyed my visit here! Loved this post! Julee Rosso was the Silver Palate girl. Would love to see that cookbook will look it up! Thanks for mentioning it! When I was a teenager my mother bought one of those aluminum Christmas trees. It had a spot light that shone on it with a filter in front of it that changed to 4 different colors. We had that tree forever. She loved that thing! Great post Debra! I have that book! Bought it years ago when it first came out and read it cover to cover every year. It is falling apart now but still one of my most favorite books. And yes, I could not imagine having four 20-ft. trees in a living room! Fabulous! I don’t think there is a boring chapter in the whole book, each one is interesting. Going back to read this Sunday’s post again. I love to read about the Christmas memories that people have. Oh my gosh! The disaster that was called tinsel. Thank heavens we don’t do that anymore!!!! No more clogged vacuums!! My mother-in-law had a silver tree. 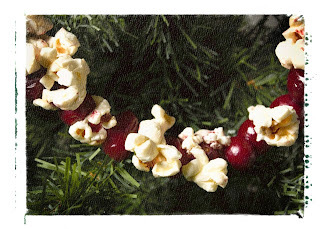 As a child, we decorated with tinsel, popcorn, cranberries, and buttons because my mom worked in a factory. And, I remember taking each piece of tinsel back off the tree – hated that stuff. I love these nostalgic trips back in time. Other bloggers take a stab at them, but you always do yours best, Debra! My mom told me about trees with real candles and her dad standing at attention with a bucket of water. I remember that yucky tinsel too. But the aluminum tree with the multi-color filter – omg I almost died when I saw that my new mother-in-law had one – yikes! But now I wish I had it, just for “old time’s sake” I guess! What a fun post! I always wanted one of those silver trees! I love the vintage memories so much. Thanks for sharing with us at TTF! We had an aluminum tree and so did my grandparents. I didn’t like that we couldn’t have lights with them. Thanks for sharing your vintage post with us at my party! Our church had one of the tinsel trees. Great memories. We had an aluminum tree also. We had an electric “color wheel” that lit the tree yellow, blue, green and red as it turned, so we didn’t miss the lights. When mom bought a lifelike faux tree years later, my grandmother took the silver tree and I loved seeing it in her house at Christmas too. Thank you for sharing this at the HomeAcre Hop; I hope you’ll join us again this Thursdays. Can you tell me where you got this particular photograph of the New England town in the snow? I’m planning to paint a picture of it and this is the best color reproduction I’ve seen.